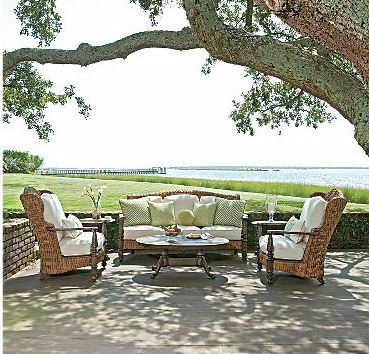 Bay Breeze Patio specializes in outdoor wicker furniture since it holds up so well against the sun, salt and sand of coastal living. 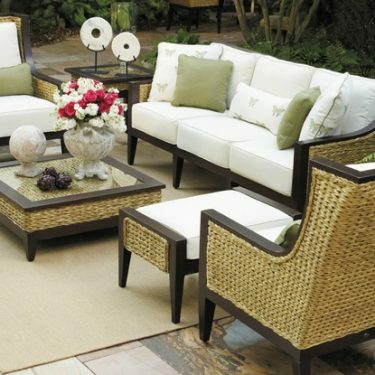 While Bay Breeze Patio has the largest selection of in-stock outdoor wicker furniture in the Southeast, the outdoor living and furniture store also features many designer wicker furniture brands. 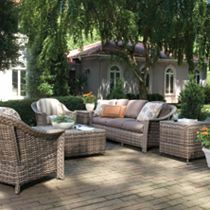 Bay Breeze Patio is the authorized dealer for Brown Jordan, Lane Venture, Lloyd Flanders and Summer Classics outdoor wicker collections. Each of these reputable outdoor furniture companies features style, design, and durability in each of their collections, bringing comfortable and lasting-style to any size outdoor living space. Aqua’s elegant curves and modern twist invite you to relish in the tropical, relax in unique style, and transform any space into the extraordinary. Latin for water, Summer Classics’ Aqua resin wicker patio furniture is a perfect simulation of water hyacinth made of their exclusive N-dura™ resin. Click here to view the full Aqua collection. With its curved arms featuring exposed cushions, Summer Classics’ wicker resin patio furniture is hand-woven with their N-Dura™ resin wicker finished in Black Walnut. The anodized aluminum feet ensure that the collection will be part of your life’s best moments for years to come. As stately and elegant as the goddess Athena, Summer Classics’ outdoor wicker furniture collection brings its timeless beauty to any outdoor space. Click here to view the full Athena collection. 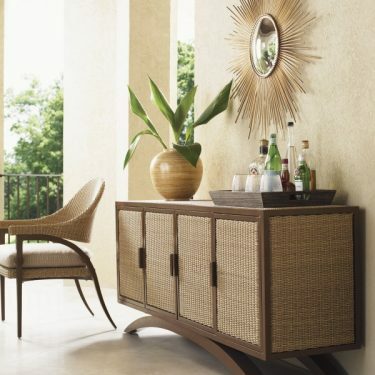 With a striking arched base and ample storage, the Aviano buffet marries form and function. Behind each of the four doors is an adjustable shelf for managing outdoor entertaining decor. The unit will also work for an outdoor media console with space below for components. Dimensions: 70W x 18D x 30¾H in. The graceful barrel-back Aviano Chair features an open back and sides, offering a glimpse of the upholstery correlations on the cushion and back pillow. Dimensions: 32W x 35½D x 34H in. The waves of the Aviano cocktail table base provide a never ending visual motion that is both pleasing and relaxing. Order the 3220-943GT glass table top to complete the look. The contemporary channel design is a signature element of the Blue Olive collection. Each vertical channel features a striking herringbone weave of all-weather wicker. The unique double-arm offers a generous armrest while creating a stylish inset below the arm that cradles the edge of the seat cushion. Dimensions: 89W x 39D x 34H in. With its traditional silhouette available in high-back comfort, the Camino Real collection will make your outdoor living space your favorite getaway. Offering stylish comfort and long-lasting durability, each piece starts with premium materials such as strong aluminum tubing and 100% virgin vinyl, hand-woven to withstand environmental elements. Click here to view the full Camino Real collection. Executed in durable woven wrought aluminum, Summer Classics’ Club Woven is ideal for any outdoor space. The woven spin of the Club collection, this line has the ability to use the sectional corner piece arranged or paired with others. Click here to view the full Club Woven collection. For a more modern take on wicker, consider the Elements collection. Designed by Richard Frinier for Brown Jordan, Elements was created to bring thought to what can be achieved using the various elements of good design and stylish forms. Uniquely shaped and artfully crafted pieces, combining a new, hand-woven and mohair-textured Resinweave® with powder-coated aluminum frames, set the stage for functional and flexible exterior and interior spaces. The woven surfaces of the sectional, and its corner, coffee and occasional tables were designed to use a moveable thin-lined flat tray made of powder-coated aluminum, which slides easily in two directions for ease of use and also provides an interesting contrast in texture and tonal color. Click here to view the full Elements collection. Crafted in Lloyd Flanders’ exclusive SunLoom vinyl, the Grand Traverse Collection achieves lasting durability, ensuring endless seasons of comfort and conversations. Perfectly suited to the lanai, sun room, or the front lawn, the Grand Traverse Collection provides versatility to fit your lifestyle and to adjust to the changing seasons in your life. Click here to view the full Grand Traverse collection. 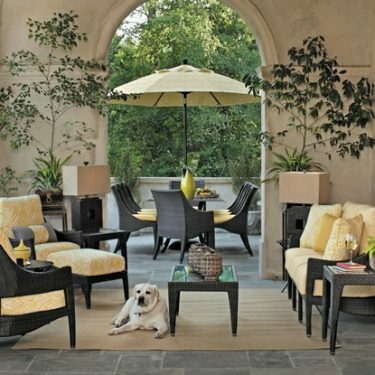 The finesse and grace of Summer Classics’ Halo collection of outdoor wicker furniture invites tranquility and eye-catching simplicity with double woven panels of N-dura resin wicker that conform to the body in exquisite form. Designed by Robert Taunton, Halo is a divinely contemporary alternative to the adirondack chair, making it an excellent choice for coastal and lakefront use. Click here to view the full Halo collection. It’s destination poolside in Lane Venture’s Leeward Collection, featuring transitional style with WeatherMaster durability. Each piece is constructed of a dark brown wide serrated synthetic material and hand woven over an aluminum frame. Leeward upholstery offers a comfortable generous arm and a relaxed high back in a clean contemporary style, coupled with complementing accent pieces. Click here to view the full Leeward collection. Summer Classics’ London collection of outdoor wicker furniture is inspired by old world design from Charles of London, incorporating polyethylene, 3mm round, N-dura resin woven over a sturdy 360 degree welded aluminum frame. Featuring replaceable teak legs, comfort rolled arms and generous proportions, London provides you with the finest in comfort, durability and classic luxury. Click here to view the full London collection. 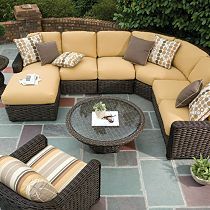 The Mandalay Collection perfectly blends the two worlds of design and workmanship into seating with understated style. The entire collection features a unique five strand weave which emulates the textures of natural sea grass. Wide arms and loose back pillows maximize comfort within the Mandalay Collection to withstand the test of time. Click here to view the full Mandalay collection. 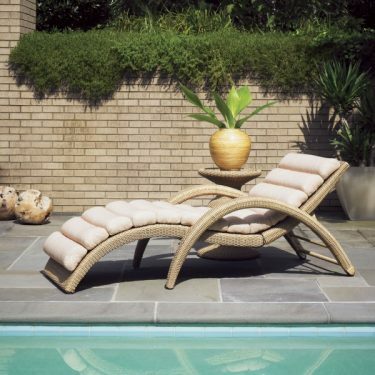 The Moorings Collection is designed with a rolled arm, double wall weave construction, with a plush high back for relaxed comfort. This collection’s synthetic large-scale fiber creates a light, unfinished rattan looking that has a very natural look and feel. Click here to view the full Moorings collection. Casual elegance is the benchmark of the Nantucket Collection, which immerses any indoor area into the grandeur of the American East Coast. Its plush deep seating offers no-nonsense comfort to the refined, history-inspired pieces. With delicate detailing and well planned styling, the Nantucket Collection inspires. Click here to view the full Nantucket collection. Looking for the perfect blend of traditional and out-of-the-ordinary? Designed by Michael Berman for Brown Jordan, Papillon is a fluid, contemporary take on woven furnishings. Curvilinear, textural, and cocoon-like in shape, with subtle wing details, Papillon’s simplicity offers deep, comfortable seating with a soft silhouette. In muted, earthy tones, the design blends organically with any exterior or interior style. In envisioning the collection, Berman was inspired by the free spirit and individuality of the papillon (butterfly) – its beauty, grace, life of transformation and quiet harmony with nature. Click here to see the full Papillon collection. Lloyd Flanders has crafted the Reflections Collection as an everyday escape. There is no conflict between form and function here. The Reflections Collection looks beautiful and built-in comfort allows easy contemplation. Subtly woven detail elements and carefully planned styling melt stress away. Click here to view the full Reflections collection. As the name suggests, the Royal Plantation collection features British West Indies style with design elements taken from the Queen Anne period. The synthetic material is woven in an intricate cable pattern with depth and texture similar to a water hyacinth weave. The baroque cast elements seen in the arms and legs give this design an old world look of carved wood antiques. Click here to view the full Royal Plantation collection. Inspired by its namesake seaside resort along the French coast, the Royan outdoor wicker furniture collection is a classic. 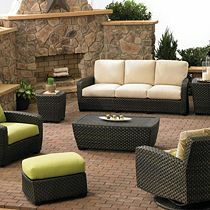 Twisted polyethylene N-dura™ faux seagrass form the sides and back of this exquisite collection. The arms and legs are created using Resysta, an eco-friendly material sealed in a scratch resistant coating. Click here to view the full Royan collection. 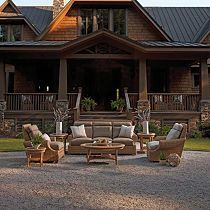 Southern Classic’s Rustic collection is perfect for any location. Hand-crafted with their superior N-dura™ resin, this outdoor wicker furniture collection is available in exclusive Weathered and Black Walnut finishes. Rustic’s rugged design will endure the years in style. Click here to view the full Rustic collection. Named for the city located on the perimeter of the Grand Canyon, along the Colorado River, the Sedona collection is substantial. The patent pending style is a 1960s reinterpretation in N-dura resin featuring the romantic European height dining collection, and made from a 6mm hand-woven round resin. Click here to view the full Sedona collection. 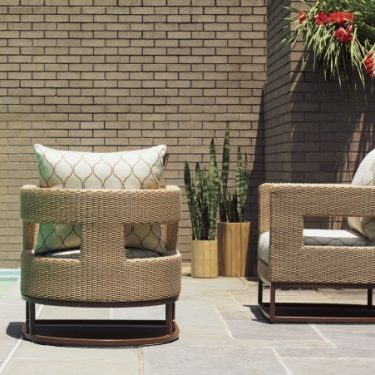 Inspired by the sedimentary lines of the South West deserts, the Sierra collection’s wide stance and mid-century modern design sets a plateau for bold and beautiful outdoor wicker furniture design. Sierra stacks wide layers of ultra-UV resistant, 7mm woven, N-dura resin and Resysta, an environmentally friendly material made of rice hulls, oil and salt. Finished in Sandalwood Resysta and Mahogany resin. Click here to view the full Sierra collection. Romanticizing its mist-laden and mountainous scenery, Viking legend describes Scotland’s Isle of Skye as the Winged Isle. Summer Classics’ stackable patent pending Skye outdoor wicker furniture has cloudlike curves and is fully woven for worry-free coastal enjoyment. Made from a 6mm hand-woven flat ™ resin. Click here to view the full Skye collection. With its dynamic open weave and versatile positioning, SoHo invites imaginative solutions to outdoor spaces. This deep seating alternative brims with style and eclipses any comfort you have come to know. Click here to view the full SoHo collection. The South Hampton collection from Lane Venture evokes a world of simple abundance with nature and sophistication in friendly competition. Each piece features understated comfort in a durable hand-woven synthetic material over an aluminum frame, transitioning any environment into the world of privilege. Click here to view the full South Hampton collection. 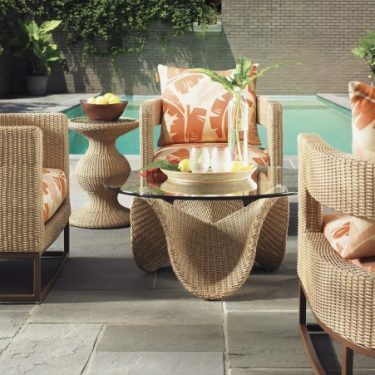 This durable wicker outdoor furniture collection by Brown Jordan is destined to become a new classic. Southampton was inspired by the beautiful architecture and lifestyles of the famous seaside colony known as “the Hamptons,” this design is timeless for its artfully hand-woven and transitional styling in the natural, dry grass and marsh colors of Sage and Sienna. 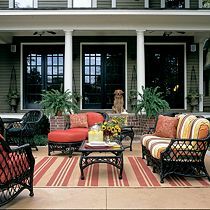 Using two of the most popular materials for outdoor furnishings, Brown Jordan’s Resinweave fiber is hand-woven over powder-coated aluminum frames to create the understated and casual-chic appeal of traditional cottage and porch furnishings. Click here to view full Southampton collection. This traditional collection blends new techniques in synthetic coloring with a more natural look and feel, plus the bonus of lasting durability. St. Simons’ new Driftwood finish, with a soft taupe and silvered grey color, gives it a warm, gently aged appearance. With its on-trend coloration on this classic silhouette, St. Simons is a must-have collection offering years of beauty. Click here to view the full St. Simons collection. Styled by German designer Mathias Hoffman, the Tobago Collection sets the standard for excellence in alternative deep-seated design. Full fluid lines ignite the imagination and enhance the look and feel of Woven Style. From its supple texture and Resysta tops to its uncommon luxury, the Tobago Collection is one to be remembered. Click here to view the full Tobago collection. The Vineyard collection is reminiscent of the Napa Valley and similar romantic expanses of coastline renowned for their lush beauty. Featuring finely wrought bodies, reminiscent of the detailed trelliswork built to support abundant yields of grapes. Sophisticated serenity, deep, plush seating and styling are all hallmarks of the Vineyard Collection. Click here to view the full Vineyard collection. The innovative and sleek shape of the Wind outdoor wicker furniture collection was inspired by the sails of a boat racing in the wind. Eco-friendly veneered Resysta with a Polyurethane scratch resistant finish, and N-dura™ resin wicker covers the removable reclining seats of this extraordinary collection. Click here to view the full Wind collection.